I blame it on PECO, but honestly, probably not anything to do with them at all. But here’s how the story goes… about a week ago, one night my neighborhood encountered a power outage, which mind you, only lasted for a few short minutes. No big deal, right (when I was a kid, power outages lasted days or longer....no joke!)? NOT! Because the next morning when I woke up & went downstairs, my coffee machine hadn’t made that magical cup of java for me. Needless to say, I wasn’t happy. Then I remembered the percolator I received for Christmas last year, which saved the day. Upon further investigation (after I had a cup of percolator coffee, including about a teaspoon of grounds - YUCK) into why the machine wasn’t working, I realized the digital clock was flashing all 8’s and no matter what I did, it wouldn’t reset. RIP my Cuisinart coffee maker. So if I’ve been a tad grumpy the last few days, perhaps it has something to do with this crazy method of coffee brewing I’ve relinquished myself to…. HA. 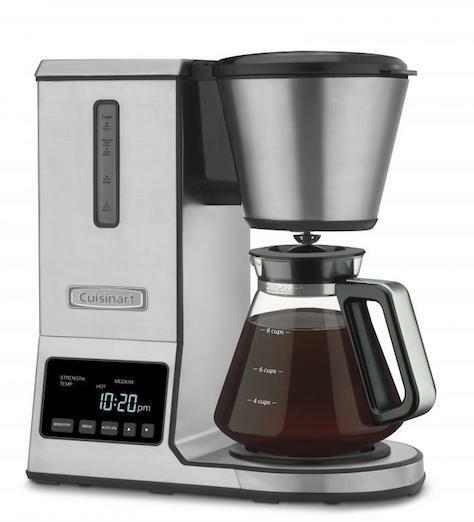 All ends well -The coffee gods worked their magic and earlier this afternoon a delivery appeared on my doorstep with the most incredible piece of kitchen machinery….the Cuisinart PurePrecision™ 8 Cup Pour-Over Coffee Brewer. Disclaimer - No compensation from Cuisinart for this post!